In his neo-Confederate “Mein Kampf,” Whither Solid South, Charles Wallace Collins quoted a full paragraph from Hayek’s The Road to Serfdom regarding the emptying out of the meaning of words. But after taking another look at the Look magazine comic book edition of Hayek’s tome, I realized that Collins’s depiction of full employment as a sinister Stalinist plot was, after all, remarkably faithful to the comic-book version of Hayek’s argument. 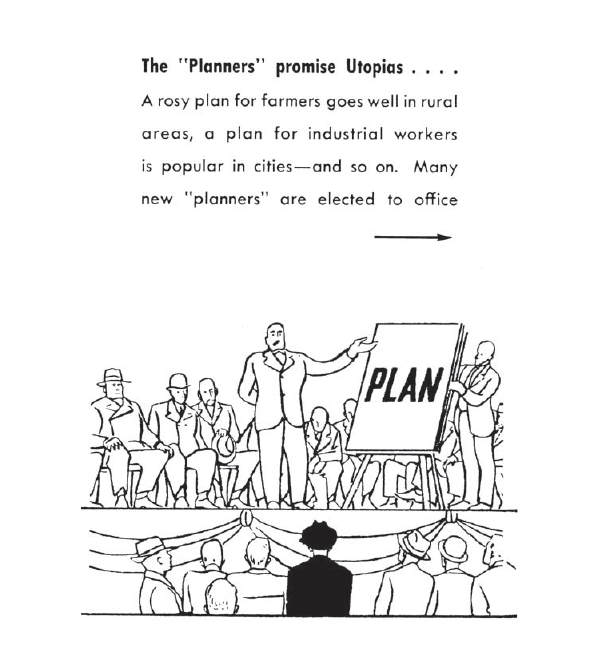 With only a little digging, one can readily infer that what the comic book refers to as “The Plan” is a policy also known as full employment (or, if you want to get specific, William Beveridge’s Full Employment in a Free Society). “Planners” translates as cartoon Hayek’s alias for Keynesian economists and their political acolytes. That no single purpose must be allowed in peace to have absolute preference over all others applies even to the one aim which everybody now agrees comes in the front rank: the conquest of unemployment. There can be no doubt that this must be the goal of our greatest endeavour; even so, it does not mean that such an aim should be allowed to dominate us to the exclusion of everything else, that, as the glib phrase runs, it must be accomplished “at any price”. It is, in fact, in this field that the fascination of vague but popular phrases like “full employment” may well lead to extremely short-sighted measures, and where the categorical and irresponsible “it must be done at all cost” of the single-minded idealist is likely to do the greatest harm. Yes, single-minded pursuit at all costs of any nebulous objective will no doubt be short-sighted and possibly harmful. 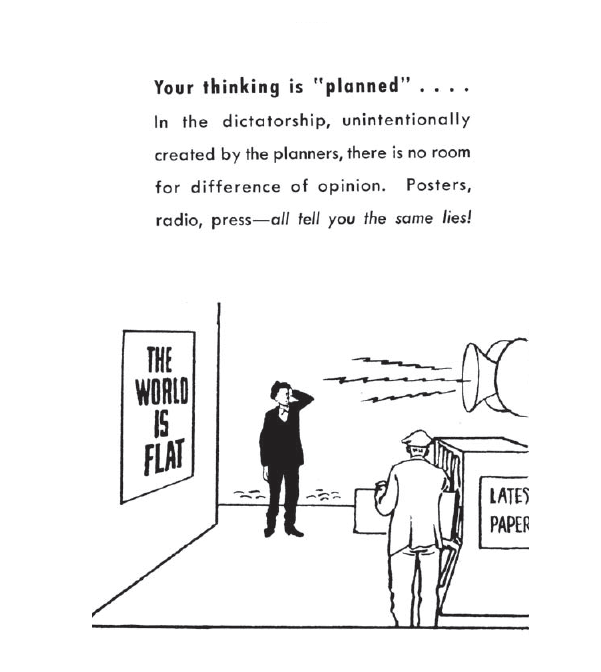 But is that really what “the planners” were advocating? Beveridge, Hayek confided, was “an out-and-out planner” who proposed to deal with the difficulty of fluctuating private investment “by abolishing private investment as we knew it.” You see, single-minded pursuit of any nebulous objective will likely be short-sighted and even harmful unless that objective is the preservation of the accustomed liberties of the owners of private property, in which case it must be done at all cost! The sixty-four dollar question with respect to the relations between unemployment and full employment policy is what to do if a policy to guarantee full employment leads to chronic upward pressure on money wages through the operation of collective bargaining. Full employment and a prosperous industry might yet be achieved if what I propose to call the three “basic principles of employment” determine our planning. The assertion that unemployment is “voluntary” and can be cured by reducing wages is the classical assumption that Keynes challenged in the theory of unemployment. Hutt’s second principle, that full employment, achieved by wage cuts, will maximize the total of wages, profit and rent thus would be not be likely to command “more or less universal assent,” as Hutt claimed. But even if it did, Hutt’s stress on maximizing a total, regardless of distribution of that total between wages and profits, is peculiar. Why would workers be eager to work more hours for less pay just to generate higher profits? Hutt’s principles could only gain “more or less universal assent” if they were sufficiently opaque that no one could figure out what he was getting at, which Hutt’s subsequent exposition makes highly unlikely. Hutt’s proposed full employment plan consisted of extending the hours of work, postponing retirement and encouraging married women to stay in the work force. He advertised his idea as a reverse lump-of-labor strategy. Instead of insisting — as contemporary economists do — that immigrants (older workers, automation or imports) don’t take jobs, Hutt boasted they create jobs, specifically because they keep wages sufficiently low and thus maximize total returns to property and wages combined. He may have been wrong but he was consistent. Nor did he conceal his antagonism toward trade unions and collective bargaining behind hollow platitudes about inclusive growth. For the 117 million U.S. adults in the bottom half of the income distribution, growth has been non-existent for a generation while at the top of the ladder it has been extraordinarily strong. Or perhaps Hutt was right and what has held back those at the bottom of the income distribution is that wages have not been sufficiently low to insure full employment and thus to maximize total returns to labor and capital. The incontestable thing about Hutt’s theory is that no matter how low wages go, it will always be possible to claim that they didn’t go sufficiently low enough to enable people’s purchasing power to absorb the full flow of their services. i can’t claim to know all of what Hayek meant. but I did read one of his books and it was clear he did not mean what the right has taken him to not only mean, but to have proved. in any case it is dangerous (and a bit stupid) to base policy on what someone said or is alleged to have said. especially economists who claim to have “proved” some “law” of economics. that said, i wonder if some of what is said here is the result of over-reading what someone (else) as said: to be concerned with policies “to the exclusion of all else” is not the same as rejecting the policies while keeping other things in mind. and to recognize the potential of labor unions to force inflationary levels of wages is not the same as opposing labor unions. neither the advocates in favor of or those opposed to the extreme understanding of these cautions –including the authors of them if that is the case — are contributing much to the development of sane and humane policy. I had always thought Hayek made some good critical points about the illusions of socialists/utopians and then chose to ignore the fact that his criticism also applied to his neo-liberal utopia. But I followed up the passage quoted by Collins and it turns out that Hayek was discussing a statement made by Karl Mannheim, which he quoted out of context and egregiously misrepresented — a classic right-wing propaganda slander technique. So here is Hayek talking about emptying out the meaning from words and filling them with new content and he is doing just that to the words of another author. So maybe Hayek didn’t overlook the fact that his critique also applied to his utopia. Maybe he knew full well he was misrepresenting what he was selling, engaging in exactly the same propaganda techniques that he attributed to others. By accusing others first of doing what he was doing, it made it awkward for anyone to point out that he was doing it, too. A Rovian strategy — conceal your weakness by attacking others on precisely that issue. One of the problems with Hayek is that there was always this conflict between the “comic book Hayek” and the more scholarly and careful Hayek. In fact, there really was a comic book version of The Road to Serfdom put out in the US after WW II, which was full of this inflammatory sort of thing that doing anything to ameliorate the harder edges of capitalism put one inexorably on the road to serfdom. In the actual RtS one finds Hayek himself supporting quite a few such amiliorations, most notably social insurance, especially national health insurance well beyond what we even have in the US now with ACA. The problem for lovers of Hayek, and arguably Hayek himself, is that he simply never repudiated this comic book version of his work, even as he and many of his followers got all worked up when people, such as Samuelson, would criticize Hayek for this comic book version of the RtS, pointing out his support for these ameliorations in the original non-comic book version. However, Samuelson in his last remarks on Hayek, which I published in JEBO some years ago, effectively said that Hayek had only himself to blame for this confusion. To me it comes down to whether government is structured to serve all or some obfuscated minority of all. With that as the divider it is easy to decipher Hayek’s work and others. I have been thinking that maybe both “sides” in our mostly brainwashed America today could agree with the meme of “DRAIN-THE-SWAMP” and hope to see it carried proudly on protest signs by the non-zombies of both sides in the ongoing social upheaval. I agree that “accuse the other side of doing what you are doing” is a familiar ploy of the right. I don’t know what Hyak was really saying, or if he let the comic book version stand because he was so flattered to have his child receive such adulation, or just because he was in his dotage and didn’t really understand how he was being misrepresented… if he was. if anyone is still talking about him at all. seems there was a big rush of talk about Hyak a few years ago and now it has faded. yeah, i can write on it. will say mostly the same as i always say. but if you can point me to something specific I’ll try to address that… specifically. is Bruce up to it? He usually has a different take than i do. he knows more than i do about the players and their plans. If you spike the football at midfield it is a penalty for delay of game. Delay of game sounds like a plan right now,actually,EMichael. And you’re just jealous cuz YOU weren’t a Bernie supporter, and I WAS. Dale, I’ve been wondering about Bruce, too. As far as I know, no one’s heard from him yet. Hope he gets in touch soon. he says he is getting better. but may have a long way to go. he doesn’t have the right computer to do any serious commenting right now. I have no idea what you are talking about. Geez, look at your own link above. OR look at many links in the past. In terms of this thread, there is absolutely nothing that shows that Sanders is the 2nd most powerful man in DC. He ranks even with every other Dem Senator. That’s good news, Dale. Looking forward to his return here. And btw, I think Trump’s comment on Fri. that he doesn’t believe NSA and CIA fact-based intelligence regarding Russia’s hacking, or doesn’t care that Russia did what it did and thinks it’s unimportant, is the final straw re some Republican electors. The odds are still against it, of course, but I think it helps that by now there probably are a lot of Rust Belt blue collar voters who are no longer so enthralled with him. His claim that that Steelworkers Local president ad other union officials are lazy and incompetent and that that’s why companies are relocating manufacturing to other countries, his choosing as his Labor Secretary a fast-food CEO hostile to labor and to raising the minimum wage, his stacking his cabinet with banking and hedge fund honchos and with billionaire campaign contributors who are from the industries supposed to be regulated by the agency these people will head (or proxies for them), and the specifics of his conversations with some foreign leaders (including about his businesses there), almost certainly mean that a large segment of his voters in the Rust Belt wouldn’t be unhappy to see the Electoral College choose someone else. In my opinion, the best one they could choose would be Rob Portman, since he just won reelection in a landslide in OH by focusing on blue-collar economic concerns, and is considered enough of a moderate on social issues that Dem electors could feel comfortable joining with enough Repub electors to elect him. What’s really interesting is the strange bedfellows this is making. I read an article yesterday quoting Michael V. Hayden expressing his dismay that Trump is refusing to accept hard CIA-determined facts about the origin of the hacking by matching it to Russian hacks involving eastern Ukraine and Crimea. You don’t have to be a Bush extreme neocon like Hayden to be really spooked by Trump’s choice of Michael Flynn as National Security Adviser and by Trump’s published statement indicating that because the CIA thought wrongly in 2003 that Saddam Hussein had nuclear weapons CIA and NSA intelligence should not be believed. Just the fact that Trump has now said he thinks the CIA’s cyber forensics team is the same group that tries to determine the nuclear capacity of other countries is itself scary–and revealing. He doesn’t recognize and obvious distinctions even about incredibly important things, doesn’t understand the concept of expertise, and can’t distinguish between important and unimportant things. He’s also profoundly gullible. He doesn’t seem to recognize even the possibility that something he heard or read on the internet isn’t true. He just parrots whatever. An absolutely infallible rule of thumb is that any numeral claim he makes is erroneous, whether it’s the number of jobs saved or lost at some company or the amount that the government has contracted to pay Boeing for Air Force One replacement, or anything else, the number is something pulled ot of nowhere or is the number for something else. 1. After Iraq WMD false claim CIA as agency had lost a large part of its credibility, because it is clear that it had succumbed to political pressure and became just a pocket tool in the dirty neocon political games. At this time the pressure was from neocons in Bush administration. Don’t you think that it is possible that this is the case now too ? 2. It’s not the job of CIA to determine who and how hacked DNC computers or any other computers in the USA. CIA mandate is limited to foreign intelligence and interligence aggregation and analysys. It is job of FBI and NSA, especially the latter, as only NSA has technical means to trace from where really the attack had come, if it was an attack. So any CIA involvement here is slightly suspect and might point to some internal conficts within Obama administration. It is unlear why Obama had chosen CIA. Also as CIA and State Department are closely linked as CIA operatives usually use diplomatic cover that request looks a little bit disingenuous as Hillary used to work for State Department. In this case one of the explanation might be that it can be attributed to the desre to create a smoke screen and shild Clintons from pressure by rank-and-file Hillary supporter (and donors) to explain the devastating defeat in electoral college votes against rather weak, really amateur opponent. You should probably go back and find out exactly what the CIA said in its briefings. They are a long way from perfect, or even good, but it serves no purpose to represent what they gave the bush admin in this area. There is no chance in the world of trump not being president. waste of time to think about such a thing, much better to spend time thinking of an exit plan. Yup, likbetz, it wasn’t the job of the CIA to determine who outside this country was behind the 9/11 attacks, and to investigate whether the Boston Marathon bombers and the San Bernardino shooters were operating with assistance from Azerbaijan or Pakistan, cuz all these attacks occurred in this country and the CIA mandate is limited to foreign intelligence and intelligence aggregation and analysis. Actually, the computers were taken by the FBI and it was their cyber forensics experts that began detecting the method used, and the CIA and NSA that matched up the method, the signals—certain “signatures,” as they put it—with those that the CIA and NSA knew were used to hack computers and disseminate fake information during the Ukrainian election and in Crimea. And it was the CIA that traced a connection to a particular identified person close to Putin. But I’m sorta curious about your contention that the CIA has no legal authority to help track down foreigners’ hacking into computers in this country if the hacking is done from outside this country. Next time your email is hacked, and if someone uses that info to steel your identity, or if someone hacks into your checking or savings account, you’d better hope the hacker is in this country, cuz according to you there is no federal agency to investigate it once they determine that your computer, or the bank’s computer, is in this country and the hacker is not. God. What a dumb claim.